The NorthFlex™ NF14 Duro Task – Supported Natural Rubber* Glove by North Safety Products is a best value for its superior comfort, fit, and sure grip. Choose the NF14 Duro Task as an economical alternative to most palm coated general purpose work gloves for construction, manufacturing, assembly, material handling, shipping and receiving, general maintenance work, janitorial work and gardening. Need an economically priced general purpose work glove with a sure grip for those tough jobs that demand more wear and tear from your hands? 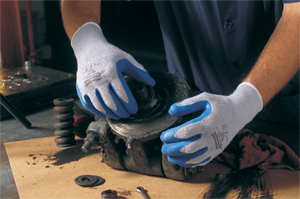 Protect your hands with the NorthFlex™ NF14 Duro Task – Supported Natural Rubber* Glove by North Safety Products. Wear it in the shop, on the construction site or in the factory, while handling tools, building materials or big boxes, use it for tough janitorial work or on the weekends in your garden. Whatever handwork you're doing – the NF14 Duro Task by North keeps you covered and protected. *Caution: This product contains natural rubber latex proteins which may cause allergic reactions in some individuals. North manufactures several alternative work gloves that contain no latex proteins, including gloves coated with nitrile or polyurethane. North understands that there is no universal glove capable of protecting your hands under any and all working conditions, which is why we develop and manufacture a complete line of leading gloves to cover your many Hand Protection needs. To be sure that you are not using the wrong glove for your work, contact North Safety Products, or visit us on the web at northsafety.com.